Before Tinman Jones graduated to a tour bus, we traveled in an old moving truck with a sixteen foot box. The box was walk through to the cab and we had customized it with wall to wall carpet, four bunk beds, two couches and a dresser. It was quite a site to see us all streaming out of there at a gas station, which I’m sure resembled the clown car at a circus. On one particular trip, the battery ran down and the engine stopped. We flagged someone down to jump us off which got us down the road to the next town where it died again. It seemed to indicate the alternator was no longer charging. Being only twenty miles or so from the camp we were to play, we felt the most important goal would be to get to the venue and meet our obligation. We coasted to a side street and I took the battery out and walked it to a near by service station for a quick charge. When I returned, the others were talking to an elderly gentleman with a large frame who went by the name Adolf. Adolf had a Buick with a trunk loaded with so many tool it sank low to the ground in the back. We explained our plight, and Adolf agreed to follow us to the campground and offer his mechanic skills on site. 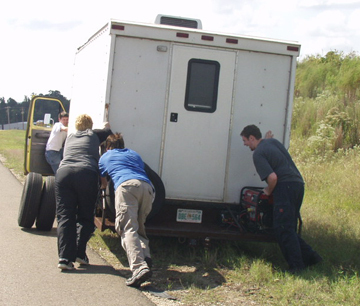 At the campground, we unloaded the trailer while Adolf removed the alternator. Once the part was removed, Adolf informed us of his plan to take the alternator into town to be tested at a parts store, and to do this he would need cash to purchase the new part if needed. Every red flag went to the top of the pole and waved violently as we pictured our alternator and money disappearing forever. What other choices did we have? With little other options, we handed over a tidy sum of green over to a man we have known barely one hour and saw him drive off into the distance as we said a prayer. With Adolf gone, we continued preparing for the concert, and just before time to start his low riding Buick was coming back down the road. The verdict from the test showed the alternator was in good working order, and he returned every dollar we handed him with the pledge he would continue working on the truck while we played the show. At the conclusion of the concert, we broke set and loaded the trailer, but there was no sign of Adolf, no note or explanation of any kind. We didn’t know if the truck was fixed or if we were stranded there for the night, so we piled in and turned the key. The old truck fired up and purred like a kitten, and we arrived safely at our destination on the long nights drive. To this day we do not know what Adolf did, who he was, where he went or why he left without us being able to thank or compensate him, but we praised God for our “Good Samaritan” who just happened to have a trunk full of tools. God knows every detail of what you need and will not just send random assistance, but will send help equipped to meet your specific needs.